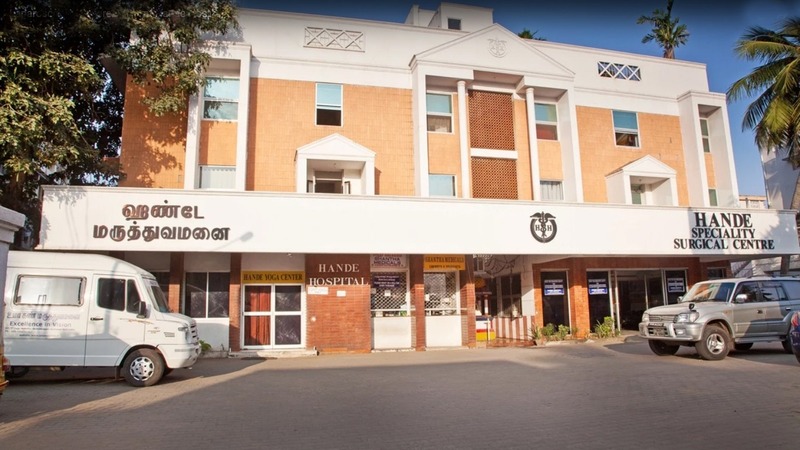 Hande Hospital is a 50-bedded Multispeciality Hospital with ICU facilities, three state-of-the-art Operating Theatres, Labour room, Endoscopy room, X-Ray (Digital), Ultrasound, Echocardiogram, Physiotherapy departments, a 24-hour NABL approved Laboratory and Pharmacy. Dr. H.V.Hande former Health Minister – Government of Tamil Nadu who has been a clinician for nearly 60 years, started Hande Hospital in 1984. Dr. Krishna Hande MS, FRCS, MCH (Plastic) is the Medical Director and a Specialist in the fields of General Surgery, Laparoscopic, Plastic and Cosmetic Surgery. The Hospital has a team of senior Specialists all experts in their chosen fields and well-trained paramedical Staff. It is empanelled by all Third Party Insurance Agencies (Part of the PPN Network), various Corporate clients, and also by the Government of Tamilnadu for its Employees and The Chief Ministers Health Insurance Scheme.